The cold weather has settled in and along with it the fun of winter….boots, jackets, skiing, and warm beverages. But for some, those cold days also bring winter tooth pain. Why? And more importantly, what can you do about it? What Causes Winter Tooth Pain? There are typically three reasons for winter tooth pain: tooth sensitivity, high altitude and injury/dental trauma. Tooth sensitivity is a common dental problem that occurs when the enamel of a tooth has worn down or cracked, exposing the dentin layer of a tooth. Dentin is the layer of the tooth that covers the nerves. When it is exposed, it can cause mild to moderate pain when eating certain foods, drinking hot or cold beverages, or even being exposed to cold air. If you experience sensitivity while in the cold, avoid hot and cold beverages and spicy foods, and then plan on seeing your dentist because tooth sensitivity can be treatable. You’ll want to see your dentist to rule out serious concerns like a cavity, cracked tooth, or infection. Your dentist can provide you with suggestions for the best treatment for you, which may be as simple as changing toothpaste. Sometimes something as simple as a change in atmospheric pressure can cause tooth pain. It even has a name – barodontalgia. Commonly recognized when scuba divers descend into deep waters, there is a pressure referred to as “tooth squeeze.” This same effect can happen in high altitudes, like when you go skiing! If you notice tooth pain when you are at higher altitudes, it is important to see a dentist to rule out a problem. The most likely problems are a damaged filling or crown, a cracked tooth, tooth decay or enamel wear. In the throes of tooth squeeze? Avoid hot or cold foods and drinks, they can make the pain even worse. Once you get home, schedule a visit with your dentist. Colorado is known for skiing, snowboarding, sledding, tubing, and more. Ice skating, cross-country skiing, snowmobiling… the options are endless in our beautiful state once the snow falls. While most of the time these winter sports are nothing but fun, they aren’t without risk. Should your ski trip include some kind of dental trauma (and resulting winter tooth pain), see a dentist right away in order to ensure the best outcome for your mouth. 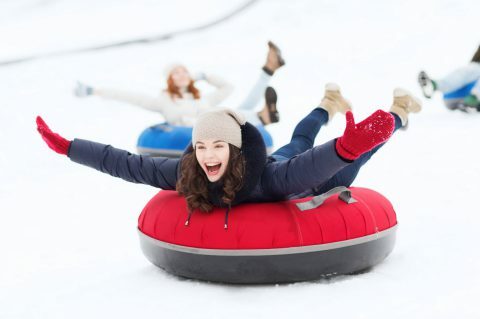 When it comes to winter sports, however, keeping your teeth safe can be as simple as wearing a mouth guard. Your dentist can help determine the best solution, as well as set up a foundation of care in case there were a traumatic injury. While mouth guards are not 100% perfect, they can help reduce injury and the resulting winter tooth pain. If you are visiting or living in Colorado and are experiencing winter tooth pain, don’t suffer another day. Contact PERFECT TEETH today at 844-717-9588 or click to find a Colorado dentist near you. Reviewed by Loveland, Colorado Dentist, Dr. Yvette McMullen of PERFECT TEETH – Centerra.